Monitoring is the process of obtaining information about the utilization of memory, cpu, bandwidth and storage. You should start monitoring your system as soon as possible, to be able to create a baseline. Make sure that you get to know your system! This baseline is important because it allows you to see a steady or sudden growth in resource utilization and likewise steady (or sudden) decline in resource availability. It will allow you to plan for scaling up or scaling out. Let us look at some tools that go beyond ps fax, df -h, free -om and du -sh. To start monitoring, you can use top. This tool will monitor ram memory, cpu and swap. Top will automatically refresh. Inside top you can use many commands, like k to kill processes, or t and m to toggle displaying task and memory information, or the number 1 to have one line per cpu, or one summary line for all cpu's. You can customize top to display the columns of your choice, or to display only the processes that you find interesting. 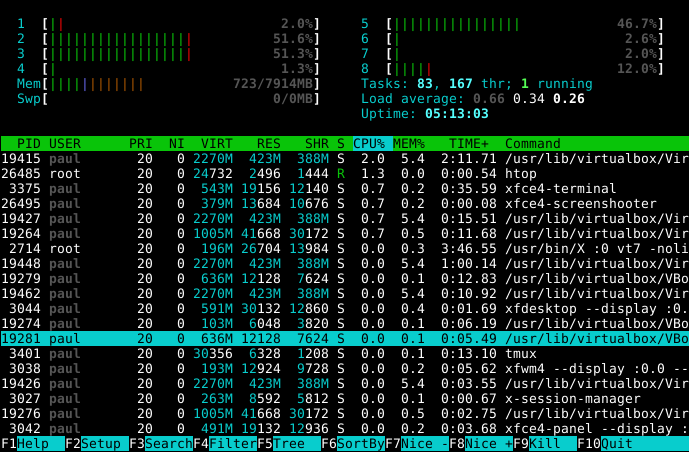 The free command is common on Linux to monitor free memory. You can use free to display information every x seconds, but the output is not ideal. It might be more interesting to combine free with the watch program. This program can run commands with a delay, and can highlight changes (with the -d switch). To monitor CPU, disk and memory statistics in one line there is vmstat. The screenshot below shows vmstat running every two seconds 100 times (or until the Ctrl-C). Below the r, you see the number of processes waiting for the CPU, sleeping processes go below b. Swap usage (swpd) stayed constant at 144 kilobytes, free memory dropped from 16.7MB to 12.9MB. See man vmstat for the rest. The iostat tool can display disk and cpu statistics. The -d switch below makes iostat only display disk information (500 times every two seconds). The first block displays statistics since the last reboot. You can have more statistics using iostat -d -x, or display only cpu statistics with iostat -c.
On multi-processor machines, mpstat can display statistics for all, or for a selected cpu. The sadc tool writes system utilization data to /var/log/sa/sa? ?, where ?? is replaced with the current day of the month. By default, cron runs the sal script every 10 minutes, the sal script runs sadc for one second. Just before midnight every day, cron runs the sa2 script, which in turn invokes sar. The sar tool will read the daily data generated by sadc and put it in /var/log/sa/sar??. These sar reports contain a lot of statistics. You can also use sar to display a portion of the statistics that were gathered. Like this example for cpu statistics. There are other useful sar options, like sar -I PROC to display interrupt activity per interrupt and per CPU, or sar -r for memory related statistics. Check the manual page of sar for more. The ntop tool is not present in default Red Hat installs. Once run, it will generate a very extensive analysis of network traffic in html on http://localhost:3000 . The iftop tool will display bandwidth by socket statistics for a specific network device. Not available on default Red Hat servers. Use iptraf for a colourful display of ip traffic over the network cards. Another popular and all round tool is nmon. You can use htop instead of top.